Yours truly will be a panelist at the "TTAB Hot Topics" session of the ABA Annual Meeting in Boston, on August 7th from 8:30 to 10:00 AM at the Boston Marriott Copley Place Hotel. Register here. 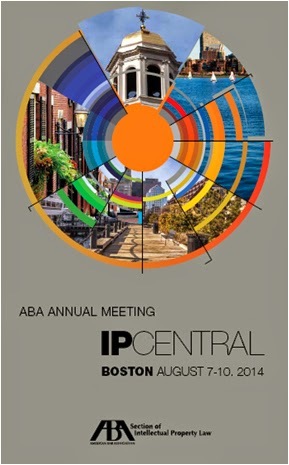 The session is hosted by the ABA Section of Intellectual Property Law. A brochure detailing the entire IP program may be downloaded here. This session will feature a lively discussion, among experienced TTAB practitioners, on a variety of recent hot topics before the Board, including disparagement and the Washington Redskins case, procedural tips, functionality, accelerated case review, fraud after Bose, dilution, appeals to the Court of Appeals for the Federal Circuit and the District Courts, and more. Erik M. Pelton, of Erik M. Pelton & Associates PLLC, Falls Church, VA, will serve as panel moderator.